We’re here with a HON PROJECT REVEAL — a before/after of a Quail Hollow kitchen and dining area that we couldn’t be more thrilled with! Starting as a classic 1990s beige-on-beige space, Berk and Kell transformed it into a clean, airy and gorgeous room! 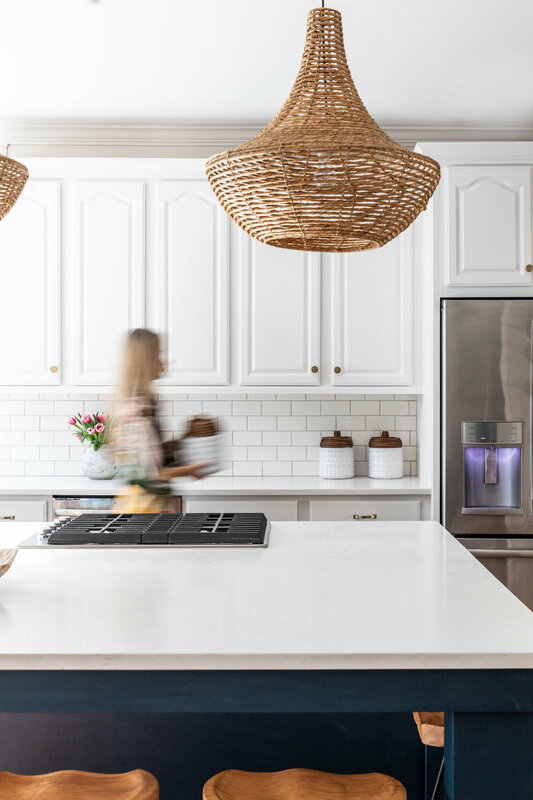 On first seeing this space, it was layered with dark elements — really dark granite countertops, a tiered bar with dark cabinets, and a stone backsplash — all gave the space a dated feel. It was tan upon tan upon tan with beige cabinets and beige walls, and the charming client asked HON to help renovate and refresh the space. The main design challenge to tackle was the large, gaping hole between the tiered island and the adjacent living room — and it was Berk and Kell’s job to figure out how to utilize the space both practically and aesthetically. With cohesian in mind, the duo designed a large, square island that removed the tiers and added space on all sides. 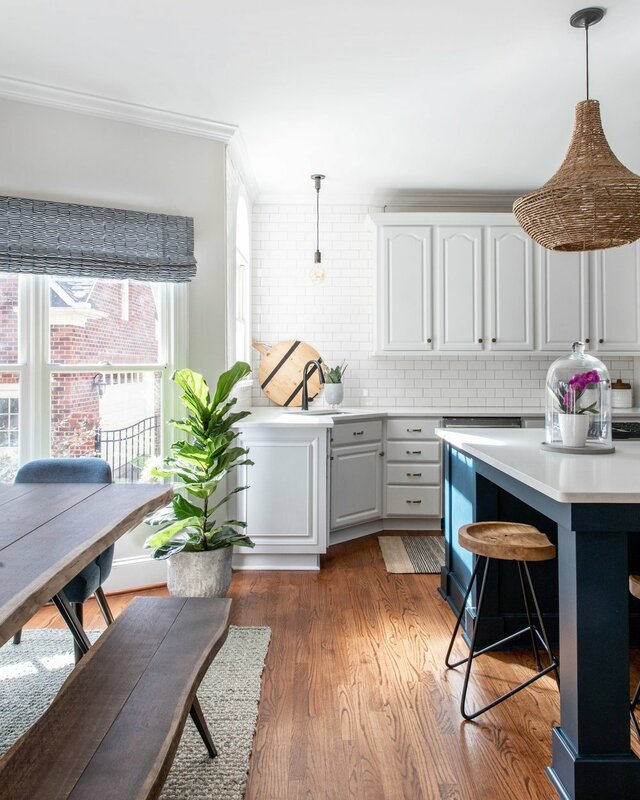 This meant barstools could be tucked around the end as well as the sides of the island, making it a centerpoint for the busy lifestyle of the family of four. To bring a warm pop of color to the space, the duo painted the island Sherwin William’s Dark Knight. The dark granite was ripped out, replaced by quartz countertops for a bright and clean look. When creating the design plan for the dining space, Berk and Kell considered the client’s and their family. 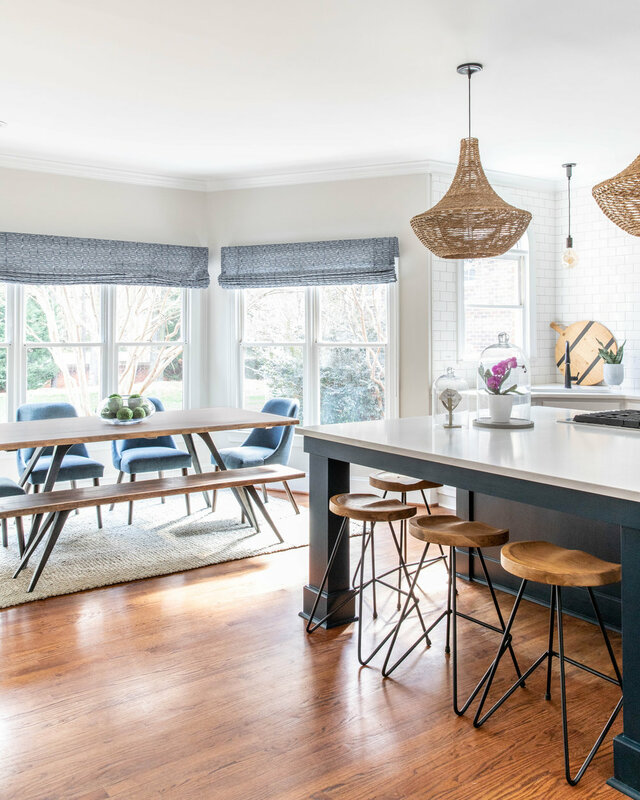 With two young boys and an open-door policy with a neighborhood of friends, HON chose a gray jute rug to bring warmth and definition to the dining area that was also easy to clean. The clients also went with a indestructible seating option for their dining area -- a bench that's inviting and can fit a crowd. To add some personality to the space, custom roman shades replaced plastic blinds in the dining area. 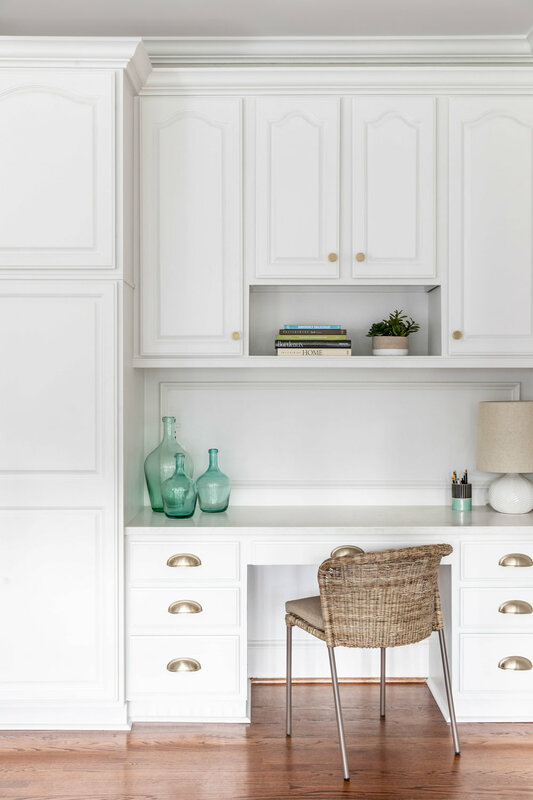 The goal was to update the space with a fresh and light feel and HON achieved that through freshly painted cabinets (Sherwin William’s Snowbound) and giving the walls a timeless hue painted in a HON favorite -- Classic Gray by Benjamin Moore. This fresh paint meant goodbye to the two-toned desk area, bringing refreshing cohesion to this half of the room. Simply and clean subway tile replaced the ombre of brown stones, previously behind the sink and cabinets. Pops of brass were added in the hardware and cabinetry pulls. Walking into this sunny, light space is a breath of fresh air and we feel lighter everytime we get to spend some time here. 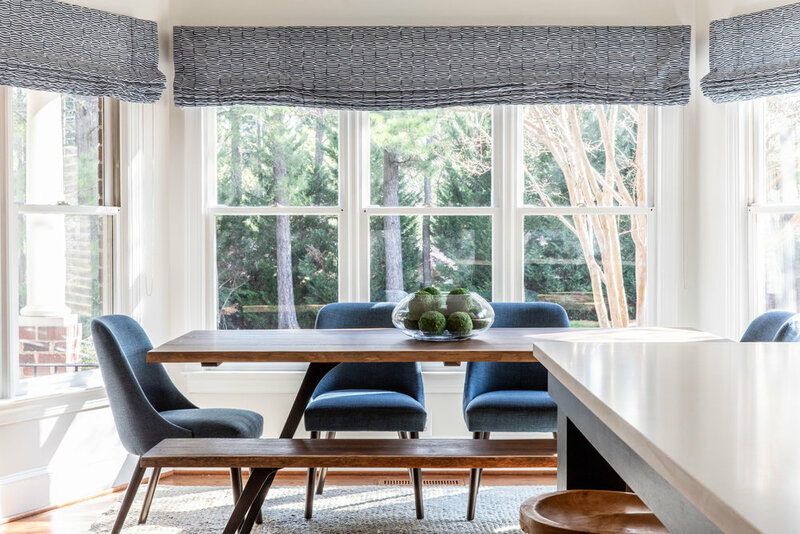 Cheers to a project reveal that we are in love with — and here’s to hoping every space we design makes clients feel as at-home and themselves as this space does for this Quail Hollow family!! 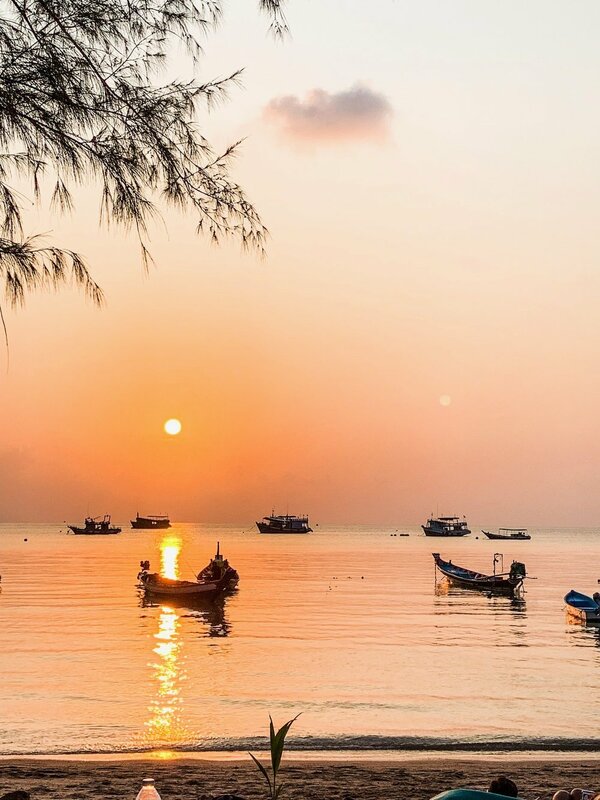 I just returned from Thailand, which is hands-down my favorite place on earth! 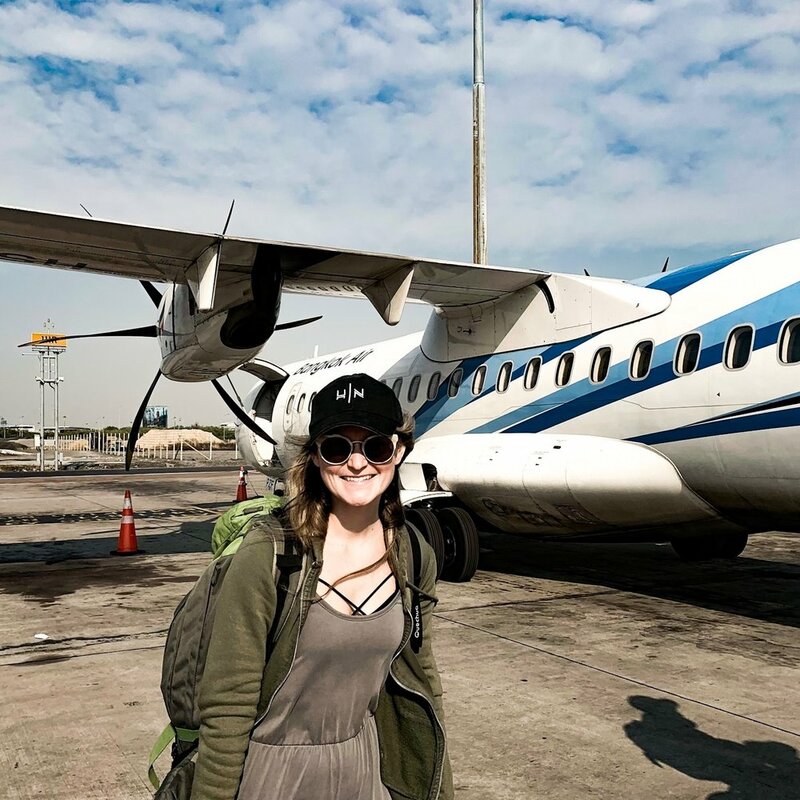 While I’m still unpacking my bags and it’s fresh on my mind — here’s my best travel tips, and Berk chimed in here, too! 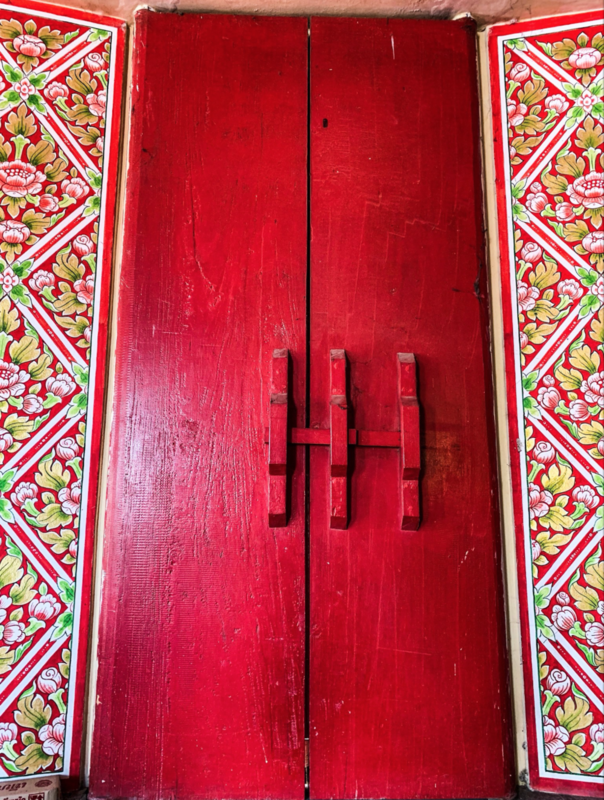 Here goes our do’s and don’t’s of international travel — with some favorite Thailand shots thrown in. Grab your passport and check the expiration date. If needed, apply for a renewal - ASAP! A passport holder is a fun way to keep track of your important documents! Once your flight is booked, check your airline and download their app. Sign up for flight status notifications. Create the wallet option on your smart phone so you’re not juggling passports and tickets and boarding passes. Research the converter you will need! Before you hit the airport, make sure your phone is charged so you aren’t in line worried about showing your boarding pass before your phone dies. Apply for TSA Pre-Check and Global Entry! We think the $85 membership fee for five years is WELL worth it — it’s a lifesaver, especially for the trip home! Keep in mind you have to apply in plenty of time prior to leaving on your trip but it saves (ALOT!) of time in customs and security lines both going and coming. Download 3-4 movies, a few podcasts and a book on your Kindle! Last trip, I stood in the airport trying to get my movie to download and it never did. Make sure you go board ready with some fun media to look forward to! Search “sleep” on Spotify and download a sleep playlist. It’s so worth it! And what I mean by “bags” is BAG! Berk and I never check a bag — unless it’s an EMPTY duffel to bring back full of goodies for our shop! This is a favorite suitcase! Pack light! 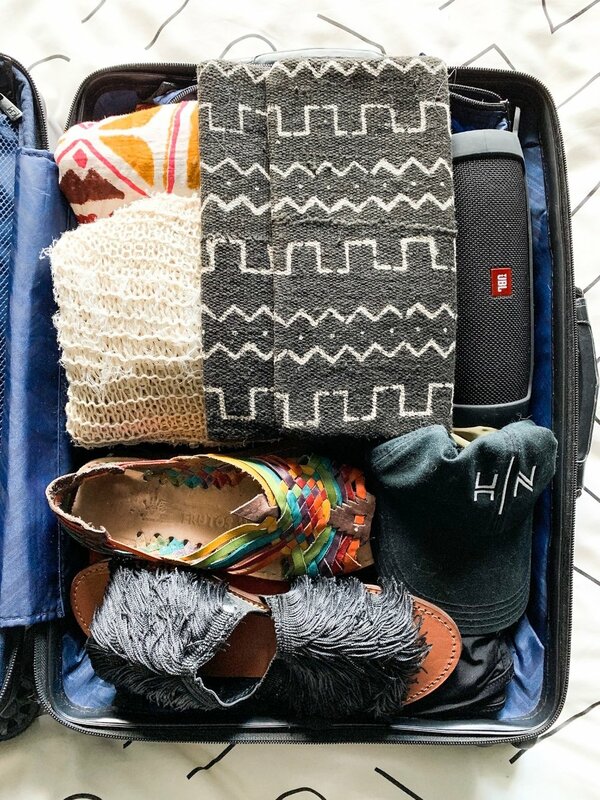 Just fill your carry on what you love! This not only cuts down on travel prep but strangely cuts down on stress during the trip. While in Thailand, I had less options to chose between day to day. Your favorites are always enough. Five days prior to leaving, lay everything out that you might bring. Set the items in your guest room bed, perhaps, so that you can walk in and out a few times a day and start removing things you’re not thrilled about bringing. This Calpak laptop bag is tried and true and we’ve found nothing safer or easier to carry for our computers! It’s a backpack and stylish, too. Nothing is worse then chapped lips on a plane! We never leave the house without this! Travel-size dry shampoo is your best friend while en-route and all trip long. This (travel size) facial spray is magic for when you start to feel like you need a mid-flight refresh. These no-leak containers are perfect for toiletries. Berk and I both are suckers for a travel uniform, meaning our favorite joggers, a T-shirt, lightweight and comfy sneakers (perfect for when we have to sprint to our gate!) — and most of all, soft socks. Sounds ridiculous but it makes the hours and hours on a flight that much more comfortable. Tiger Balm is magic — it’s a tiny container, perfect for your carry on and takes away headaches and neck/muscle tension quickly. I love having these Colgate Whisps on hand to freshen my breath in between flights. Neck pillow — this one is perfect, Berk and I have both used it every trip we’ve taken! It inflates/deflates so doesn’t take up too much space, and truly I can’t sleep without it! Benadryl — take it 20 minutes prior to being ready to go to sleep and turn on your sleep playlist! Investing in these noise-canceling headphones is a no-brainer. They dramatically changed my experience on flights! They’re incredible. Eye Masks really help get your zzz’s in on a flight! When you have long layovers, find the closest lounge to pay to get into and use their shower! Definitely worth the fee! Buy some healthy snacks ahead of time or in the airport shop — they always have a nice selection and will help you feel better during your flight. Buy a large bottle of water prior to boarding your flight — and try to get some steps in. We walk our terminal at least twice, just trying to prep for a long time staying seated. When you get into the international airport, make sure to stop at the kiosk and swap out SIM card on your phone! All international airports have numbers of places to do this — and even better, it is really economical! On every trip, we also rent a hot spot so we can work remote — and stream music/vidoes while we travel on the bus/subway! 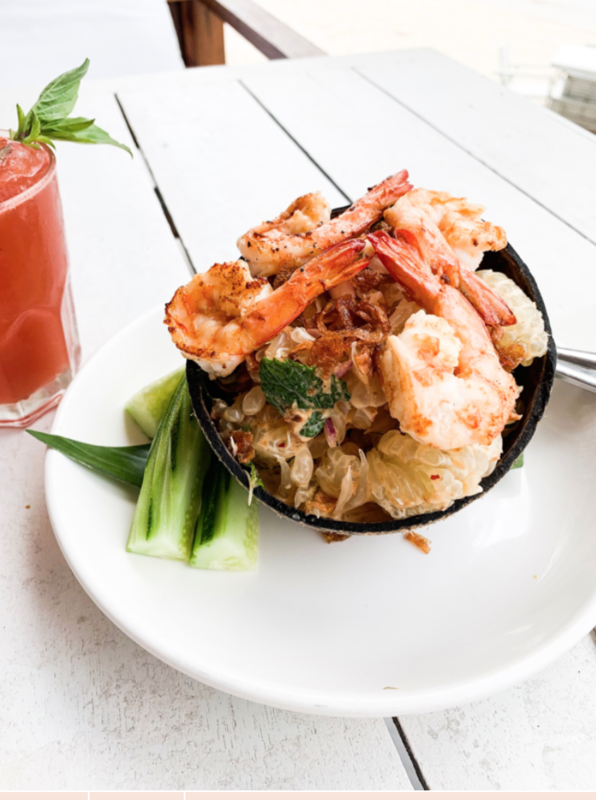 Next month, expect a Guide for Thailand to be released and a summertime Guide to Tulum! In the meantime check out our Guide to Marrakech and Guide to Sayulita. 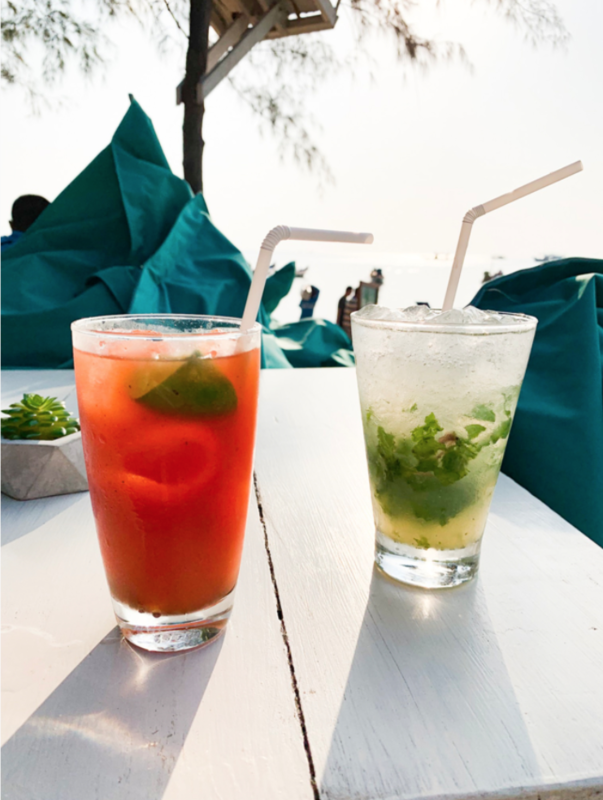 Cheers to a new year full of travel! 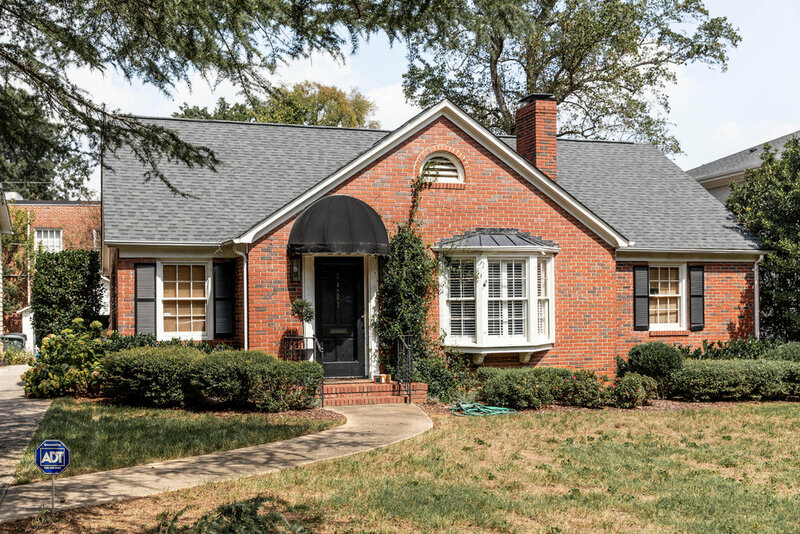 About two years ago, Berkeley completed a renovation to her brick bungalow in Myers Park and as is often the case, was not able to match the new brick to the existing brick tone. Her and her husband, Diek, knew down the road they would be painting the house to get back a congruent look — but in the whirlwind of life and launching House of Nomad — two years slipped by! This fall, the timing was right. 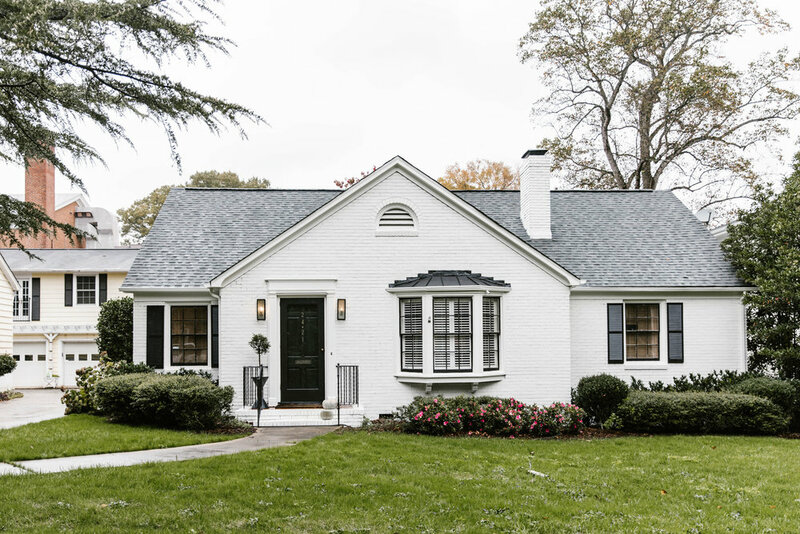 To give her 1940s home an updated look, she researched the perfect shade of white paint. Note: brick homes are a House of Nomad favorite and matching brick is really tricky, so in the case you cannot create a perfect match — painting is a great solution. It not only gives the house a facelift but you still have that brick home which is such a timeless look. 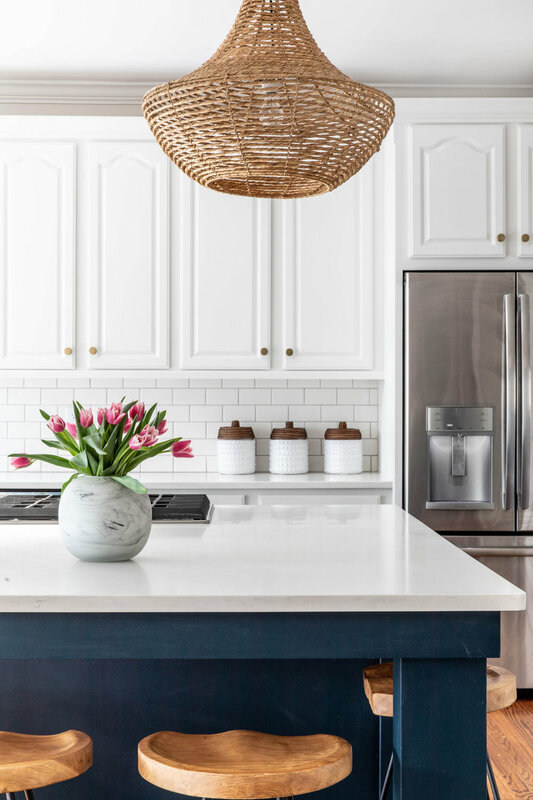 In search of white color that wasn’t yellow-based or didn’t look stark white (think: avoid the house looking like white-out had been dumped all over it) Berk came across Simple White by Benjamin Moore. 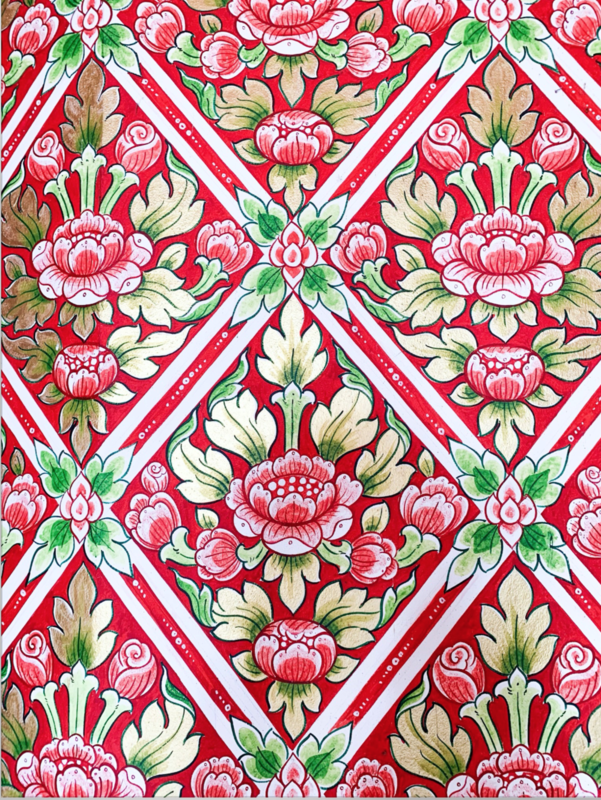 This color had depth and richness to it but wasn’t yellow — it was exactly the updated, timeless look she hoped for. Keep in mind that not sampling your color before painting your home is not a corner you want to cut. Select three shades and have your painter sample them on the side of the house. Live with them for a few days and look at them in different light — you’ll know which one you love and will want to live with! A trick for an updated look is to paint the window trim and the house the same color. Berk was having her trim replaced, so she jumped for Simply White for her window trim and brick. If you are not painting your trim, take precaution to make sure your preexisting color flows well with your new home color. House of Nomad loves to keep it simple, so going with the same shade is a current go-to. To add a modern vibe and some depth to her home, Berkeley decided to have her shutters, trim around her three front windows and front door painted black. She picked Benjamin Moore’s Black Beauty. 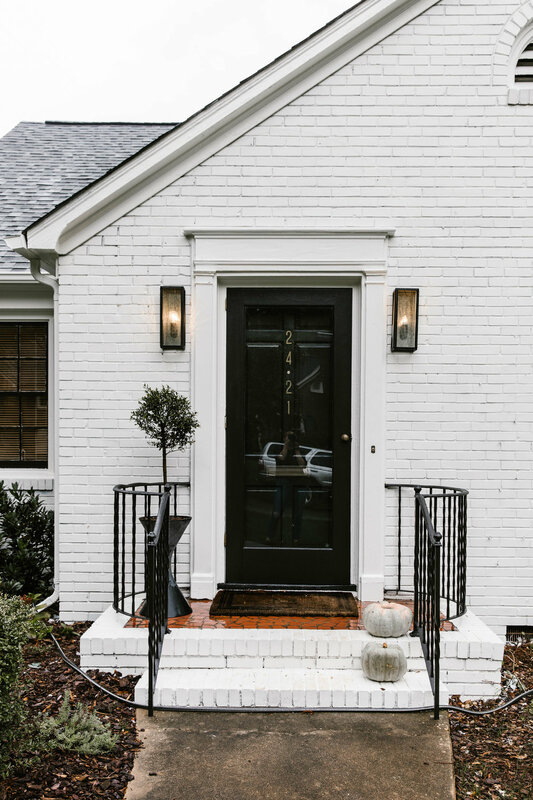 Another go-to for exteriors is Sherwin Williams Pure White paired with Tricorn Black Sherwin Williams. It was also time to update her outdoor lanterns and she wanted to go black with the lanterns to match the black door, trim and shutters. She researched something streamlined and simple and jumped for two modern lanterns by Troy Lighting. She Another option she considered were these timeless lanterns. We’re in love with the fresh, modern after of this project! What was shocking is that the visual size of Berkeley’s home doubled with the fresh paint color! The house now looks twice as big, really popping where the dark brick faded it into the background.